The success of Poetry Dog Tags grew into another idea for pre-teens. Ultimo created and designed these with an entirely different look for a new audience. 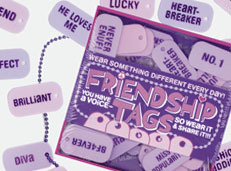 This wearable word-play consists of 48 different phrases and words on colorful plastic tags and matching chains to "speak your mind"...BF4EVER! Poets Who Wear It & Share It! 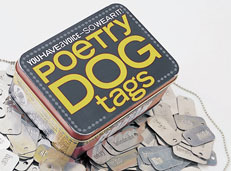 Poetry Dog Tags, first published by Chronicle Books in 2000, is a box of metal tags embossed with 250 different words. You also get 2 chains to hang these magnificent words on, so you can wear them for all the world to see (or maybe just one person in the world to see). Available in many gift boutiques Scrapbooking shops and museum shops around the globe, Poetry Dog Tags have popularity from Tokyo to Melbourne. If you can't find them in a store near you, tell them to order them from Chronicle! 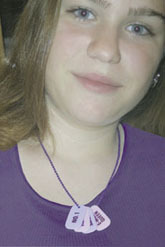 Blogging with Poetry Dog Tags>> Poetry Dog Tags, and what people are saying with them, have become part of blogs all over the place. It seems like personal expression continues to get wilder when you see what people are saying with their Dog Tags. Blog on! Scrapbookers love Poetry Dog Tags>> The endless creativity of the Scrapbooking movement began to use Poetry Dog Tags to embellish beautiful hand-made books...from everything from titles to captions. Click here for more. 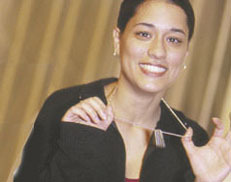 The Inspiration Behind Poetry Dog Tags is love of "word sounds", poets, and the Nuyorican Poets Cafe in New York. The Cafe has been bringing in the best, the brightest and the latest in spoken word from around the globe for over 35 years now. It is from the explosion of these voices, and Clare's good fortune to be involved while it was happening, that the inspiration for Poetry Dog Tags came to be. The Real Thing>> It's true that Clare actually does write poetry. Read some of it on the Words page. "What a creative way to bring poetry into people's daily lives!" 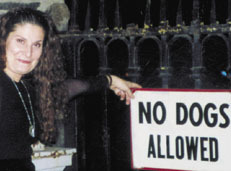 – Angeles Arrien is a cultural anthropologist, award winning author and President for the Angeles Arrien Cross-cultural Foundation for Education and Research which honors the preservation of indigenous wisdom. "You don't have to be spurred on by great poetry, like I was, to enjoy this. Simply want to try something new and speak your own mind for a change. Aren't we sick of advertising corporate logos and design house slogans?...Create your favorite mantra, funny saying; enjoy the autonomy of switching your moods whenever you want, say whatever you desire. What does mine say? I woman, wicked mama, girl love machine, investigate lips. After two weeks of wearing this, I'm lining up the takers. That inner voice of yours is waiting to be exposed; you have a voice, now wear it!" Ginger can be found at www.honeymag.com and can also be reached through LinkedIn.